Will Russian football fans pay for conflict in Ukraine? Several high-ranking European officials have called for taking the 2018 World Cup away from Russia; FIFA insists the tournament will go ahead as planned. German fans barely had time to enjoy their victory in the 2014 FIFA World Cup before debate erupted over the 2018 tournament, which is scheduled to be held in Russia. 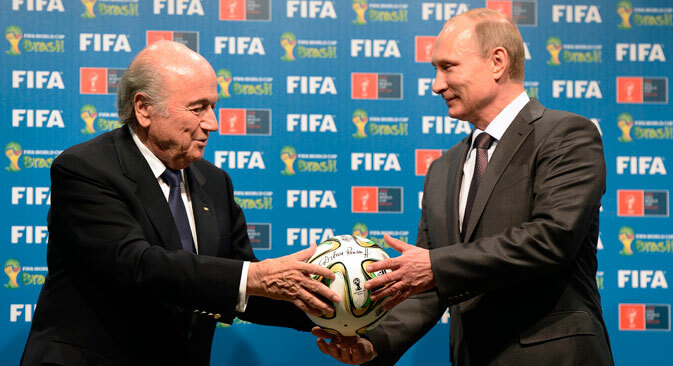 Several Western politicians have begun lobbying FIFA to move the Cup in response to Russia’s policy towards Ukraine. British Deputy Prime Minister Nick Clegg said it would be “unthinkable” to give Moscow the opportunity to enjoy the prestige of the World Cup. In Clegg’s opinion, Russia’s behavior has crossed the line, and that allowing the country to host the tournament will show the weakness of the international community. Clegg’s position is supported by Michael Fuchs, the leader of the ruling center-right coalition in the German parliament, who told German publication Handelsblatt Online that stripping Russia of its right to host the World Cup would impact it much more than sanctions. Political figures aren’t the only ones calling for a boycott. John van’t Schip, the former coach of the Netherlands national team, wrote on his Twitter account: “I appeal to the Royal Netherlands Football Union, the country's government, and FIFA: boycott the World Cup in Russia.” The tweet was accompanied by the hashtag #MH17 in reference to Malaysian Airlines Flight 17, which crashed in eastern Ukraine on July 17. FIFA officials, however, show no indication that they are taking calls to move the Cup seriously. In an official statement, the organization’s representatives stated that boycotting sporting events, as well as policies of isolation and confrontation, are not the most effective methods for solving problems. “The World Cup brings together teams and countries from around the world,” the statement reads. The Honorary President of the Russian Football Union Vyacheslav Koloskov, who is also a former vice president of FIFA, told RBTH that the Russian authorities have the support of FIFA’s leadership. “The 2018 World Cup will be held in Russia without a doubt,” Koloskov said. “We discussed the situation with [FIFA Secretary General Jerome] Valcke and [FIFA President Sepp] Blatter. They support us in the current situation. Everyone in FIFA has an interest in keeping the events in Ukraine from getting in the way of organizing the World Cup. We are intensively preparing ourselves to host the World Cup. We are constructing the necessary infrastructure, including stadiums, bases, and hotels. Maybe a little behind schedule, but I am sure we will manage to get everything done in time. “Hardly any of the teams decided to boycott the 2018 World Cup. This is a severe blow to the reputations of countries and their soccer players, who are in a bitter struggle to earn the right to take part in the finals,” Koloskov added.